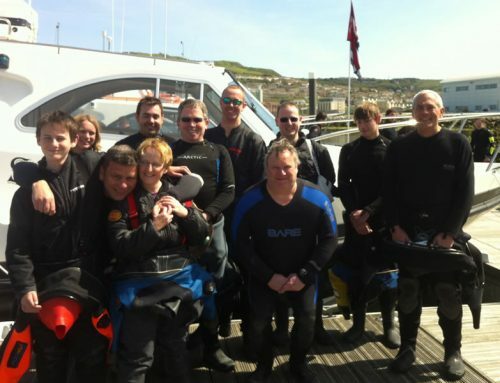 Cold water diving is considered to be when the temperature of the water drops below 7 degrees C. This is not uncommon in the UK in Winter months, especially the inland lakes. Regulators perform differently in cold water diving compared to temperate water – therefore your challenge is to do everything that you can to prevent the regulator from freezing which, which then causes free flow. Use regulators designed specifically for cold water diving. These regulators are often either environmentally sealed or use a special ‘heat sink’ that uses the cold water to ‘warm’ the 1st stage which limits the formation of ice. Avoid breathing from the 2nd stage out of the water when the air temperature is low. The aim is to minimise the cooling effect of the air and the diver’s breath by not ‘overworking’ the 1st stage. Practising air sharing and deploying surface marker buoys in cold water is not ideal. If you have a 2nd stage with a breathing resistance adjustment, remember to always have the adjuster set to minimum when it is not being breathed from. The greater the amount of exposed metal, the greater the warming effect of the water can be maximised – pull back hose protectors on metal hose ends. This also helps to extend the life of your hoses as it stops debris and water trapped against metal fittings from causing corrosion. To limit freezing risks, a lower pressure tank is recommended for cold water. A 232 bar rather than a 300 bar is recommended. The higher the pressure, the higher the risk. Get air fills from a reputable source – the drier the compressed air, the lower the freezing risk. Inflate BCDs and wings slowly – preferably during the exhalation phase to ‘unload’ the 1st stage. Why Does Free Flow Occur and How do I Stop It? It’s important to understand why free flows occur and how to handle them should they ever occur. Regulator 2nd stages essentially act as pressure relief valves – they are designed to do this. Normally in temperate diving, if an adjustable 2nd stage purge button hits the water or is even lightly touched when it is set to maximum but not being breathed from, it can go into free flow. To stop this sort of free flow, put a thumb or finger over the 2nd stage mouthpiece to break the flow of air and then – if the 2nd stage offers such a facility – set the breathing resistance level to minimum. If this doesn’t stop the freeflow, get your buddy to close and reopen the valve. Regulators – when set up correctly as per manufacturer’s procedures – are design to easily give the diver air to breathe. A 1st stage freeze will cause the mechanism to free open within the 1st stage which will cause a 2nd stage free flow (remember it’s a pressure relief valve!). Follow your training and ABORT THE DIVE. If the cause of the freeflow is thought to be a 1st stage problem, the regulator will still not work properly even on dry land and in a warm environment. Also, try to identify where the free flow came from – was it a 2nd stage or your Autoair or BCD/wing inflator?